Tree Speak | Casey Trees: Today, Casey Trees Turns Ten! Cue the eco-friendly confetti drop. Hug a loved one. Give your pet an extra treat. It’s time to celebrate. 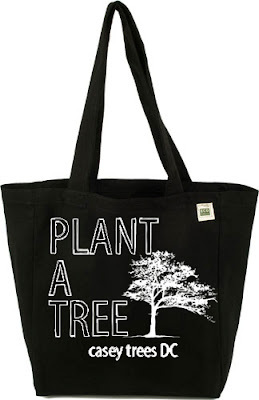 Our friends at Bare Tree Apparel are marking this milestone by offering a very special gift – a hand printed, limited-edition tote bag - to our friends who become Tree Champions by May 1. Made from recycled cotton, this eco-friendly tote is perfect for trips to the farmer’s market, library, or a stroll around town and it conveys what we and you consider important – adding trees across D.C. And you will be doing just that when you sign up to be a Tree Champion. Tree Champions are among our most loyal and dedicated supporters. Their monthly gift of $25 or more – just 82 cents a day – provides us with steady, reliable support to continue providing trees and educational programming at no cost to schools, public parks, recreation centers and other deserving institutions. When you give monthly, you'll join a community of supporters working tirelessly to forge a green legacy in our nation’s capital for future generations to enjoy. Hurry! This gift offer is limited to the first 50 new Tree Champions.